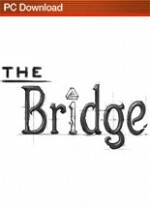 Indie game fans have been waiting for years to play Ty Taylor and Mario Castañeda's stylish mind-bending puzzle game, The Bridge. While The Bridge features arresting visuals and a few clever gameplay mechanics, some convoluted puzzles and a sluggish pace detract from the overall experience. Each level in The Bridge is a surreal, hand-drawn landscape reminiscent of the optical illusions of M.C. Escher. The visual style is the high point of the game, and complements your reality-breaking abilities. In order to make it to the exit door of each level, you control both your character and the rotation of the 2D environment, which affects gravity based on the changing orientation of the landscape. Early puzzles such as tilting the world to slide up a steep slope or turn a ceiling into a floor are simple but effective. A few more mechanics, such as inverting your character in the environment or changing the gravitational direction of individual objects, evolve the formula for better and for worse. While the gameplay mechanics are novel, some of the puzzles are so complicated that solving them requires tedious trial and error rather than genuine problem solving. Rarely did I have that "Aha!" moment that great puzzle games like Fez and Antichamber inspire. Instead, solutions often involve trudging back and forth through winding mazes in order to see how the world will react when you flip a switch or alter gravity in a specific way, the effects of which aren't always immediately apparent. I wouldn't mind having to experiment if it wasn't so painfully slow; the environment rotates at a sluggish pace, and your character's speed maxes out at a brisk walk. The slow speed of your character and objects combined with their momentum makes it easy to over-rotate your environment, at which point you watch your character soft-shoe his way down a slope or off a ledge while you try in vain to right the ship. Luckily you can rewind time with the press of a button at any point, but even that can be slow when you have several minutes of a failed solution to undo. The Bridge also lacks any sort of hint system, so if you get stuck on a puzzle, your only option is to continue experimenting or retreat to the Internet for help. Just when I started finding The Bridge's puzzles more frustrating than fun, a mid-game event resets the world, requiring you to revisit all of the previous levels which sport trickier puzzles the second time around. While it may sound like a cheap gimmick to recycle environments, these mirrored levels provide the most entertaining puzzles in the game, and introduce more variety via a few new mechanics such as controlling two characters at the same time. After getting frustrated with the final puzzles of the first half of the game, I was pleasantly drawn back into The Bridge's unique and imaginative world with the more creative challenges of the second half. Eventually these mirrored puzzles also ramp up to a slow grind of trial and error, but finally hitting upon the correct solution remains satisfying throughout, even when progress comes from luck rather than strategy. While all of the puzzles don't reach the same level of excellence as The Bridge's impressive visuals, recommending this game to indie fans is still an easy call. Despite some difficulty spikes, patient players will be pleasantly engaged in The Bridge's surreal, black-and-white world. While The Bridge features arresting visuals and a few clever gameplay mechanics, some convoluted puzzles and a sluggish pace detract from the overall experience.